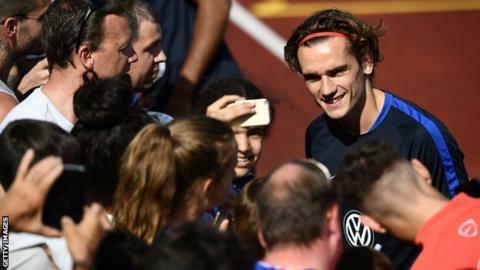 Atletico Madrid striker Antoine Griezmann has suggested he is staying with the club despite reported interest from some of Europe's top sides. The France international, 26, posted a message on social media reading: "Now more than ever! #atleti #alltogether." It came just hours after a transfer ban on the club was upheld - meaning they could not replace him if he left. It is understood the long-term injury to Zlatan Ibrahimovic has forced the club to change their priorities, with doubts over the Swede's future beyond the expiry of his contract on 30 June. After his side beat Ajax to win the Europa League last week, manager Jose Mourinho said executive vice-chairman Ed Woodward has had his targets "for more than two months". Everton's Romelu Lukaku is an obvious one, a battering ram of a striker in the Didier Drogba mould. And United have also been linked with Torino's Andrea Belotti - who has a release contract of £87m - and Real Madrid's Alvaro Morata.